Portent uses GDS every day to relay important information to our clients. Even so, being in Google Data Studio constantly has given me a perspective few have on its shortcomings. I’ll detail GDS growth opportunities here in the hopes that Nick and crew will take them with a grain of salt, but maybe move them up the roadmap. They’ve had many updates in the last year already on greater visual fine-tuning of charts and graphs, but for Data Studio to be the silver bullet for agency reporting it needs more ways to affect global settings across many pages. GDS has a few built-in themes (light and dark) that help you dictate background and font colors on entire reports, but it needs a way to store and re-use custom color palettes and fonts (including size relationships) across multiple reports. We have a style guide at our agency with hex colors and fonts we’re expected to use in all client-facing deliverables. It would be nice to capture that style and add it to a new report with one click instead of manually adding it each time. Working our style guide into Google Data Studio Dashboards has been fun, but could be easier to scale. Support for Adobe Typekit or even just matching the fonts available in other Google Doc programs (like Docs or Slides) would be sufficient here. Typography and readability are essential when presenting any content, but especially in data storytelling. Right now, only Circles and Rectangles can be drawn natively in GDS. So often, I have to screencap my beautiful visualizations in Data Studio and then annotate them with arrows and lines in other programs. 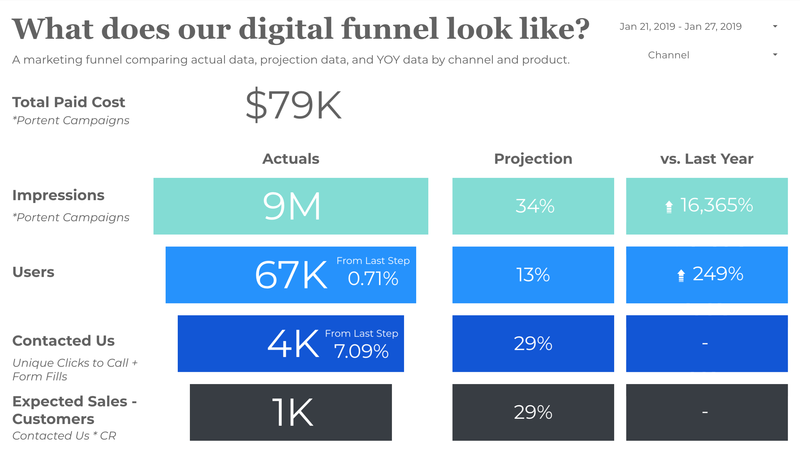 Aside from just annotating data though, we’re also working on building funnel-style visualizations for clients, and they look super clunky with only rectangles. Our funnel prototype is coming along nicely, but could use less rectangles. Aside from all the visual trappings, the data is still paramount, and some improvements there could take GDS from a great tool to an excellent tool overnight. Today, while the GDS connector for GA is pretty comprehensive, the inability to tell the Assisted Conversion story is brutal on our clients who rely on content marketing to drive results. I’ve long lamented Google Analytics keeping their attribution data separate from their primary data (in both the UI and API) and its absence in Data Studio hurts even more. Blending Data Sources is probably Google Data Studio’s most mouthwatering feature for data workers in theory. But in practice, it’s still very clunky; mostly because it lacks documented best practices and examples for things like join keys, date dimensions, filtering, and more. The other day, I was trying to create a custom field to show the % change between two data points from disparate sources and aggregate it by week and was getting insane math out of it. It turns out deltas only work on a day-by-day basis. Would’ve been nice to know before I went down a 2-hour rabbit hole thinking I did something wrong. How are we pacing to annual goals? How many conversions can I expect by the end of the month? 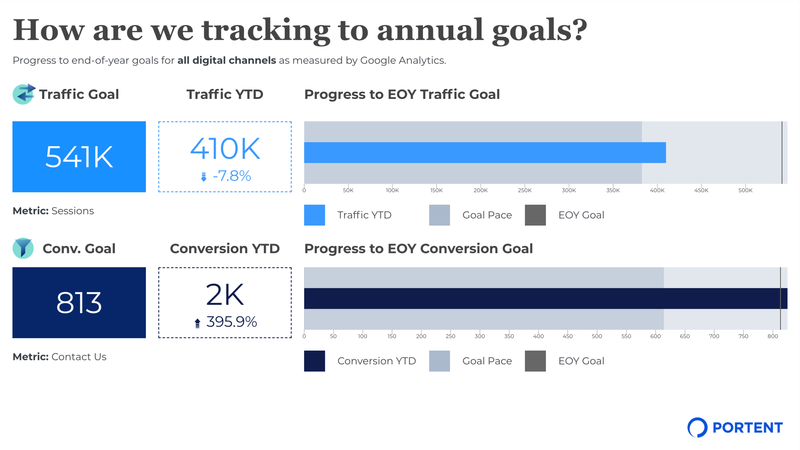 While I could manually enter those things in a bullet chart, one of our objectives as an analytics team this year is to automate everything we can so our content, search, and social practitioners can focus on insight and strategy. It’s one thing to introduce a trend line, but being able to specify a regression and project anticipated performance against actuals would make GDS a killer app for not just marketing reports, but also finance. As of my writing this, you can specify what you want to show up in a table when GDS finds a null value in a data source (either “no data,” “0,” or my personal favorite “-“). Similarly, scorecards and charts tend to break in GDS for a variety of reasons. While a glaring error message and a monkey wrench are right to see for those of us who are editing the reports, it can be jarring for clients viewing the reports. A way for us to add an “Under Construction” or “Temporarily Unavailable” message or visual to broken elements would soften the blow for viewers. When a client decides they want to see a different metric for conversions than we’re reporting on, today I have to modify each element in the report one-by-one to make that change. It would be nice to have a global find and replace or even to highlight items that share a metric in common from the same data source and swap it out wholesale. Ultimately, I’m writing all this because I care. I’m an ardent supporter of GDS and, for my money, their team is the fastest iterating product team at Google. I hope to see some of the changes I listed above adopted, but I won’t be heartbroken if it doesn’t happen. Keep up the good work! 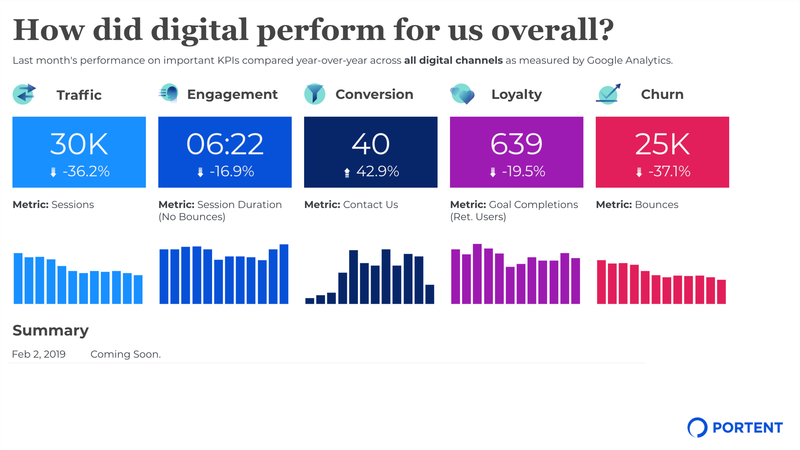 The post My Google Data Studio Wishlist appeared first on Portent. Previous PostPrevious How Will A Growing Population Affect The Uk’s Economy?